The monsoon rain pours down, washing away the dust on the trees flanking the Chaliyar river in north Kerala. Kaushiq Kodithodi is unmindful of the downpour as he paddles the two-seater kayak towards the middle of the river. At a distance there is an empty beer bottle, bobbing up and down in the water. “Pick it up,” says Kodithodi. I do, and place it in the kayak. A little ahead is a woman’s slipper followed by an empty plastic brandy bottle. A bottle cap and a large blue packet also float by. I reach out for them and recoil at the stench of rotting food, but 44-year-old Kaushiq has no hesitation in picking them up. The couple held a Catch of The Day programme recently at Cheruvannur near Kozhikode. The ‘catch’ was garbage collected by some boys. The waste that is collected will be recycled. “We are working with waste management expert Dr Reena Anilkumar,” says Kaushiq. 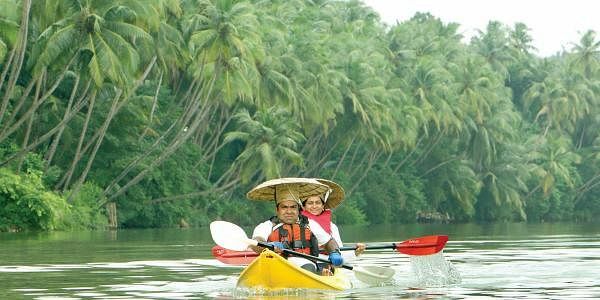 The couple also wants to promote kayaking among children. “It is the easiest and safest way to explore rivers and is a far better hobby than watching TV or playing video games,” says Ruby. Every month, the Dubai-based financial consultant visits Cheruvannur to keep the Jellyfish project moving forward with a team of hired staff. They organised a two-day Chaliyar River Challenge 2016 in collaboration with the District Tourism Promotion Council and the Clean Rivers Initiative Trust on September 23. More than a hundred people participated in the event that started from Nilambur town and concluded 62 km away at Beypore. Participants collected waste from the river.